Although the British are a patriotic nation like any other, we are also quite happy to criticise our institutions and national efforts. So before the Olympics our press was full of stories about actual or potential problems. Of course, it is another matter if someone overseas repeats these things, as a certain US politician found out. So everyone thought that being in charge of the opening ceremony was a poisoned chalice for Danny Boyle. Get anything wrong, and mistakes would be analysed in fine detail. Get the tone wrong and he would be torn apart. Given that, the reaction to the opening ceremony in the UK has been extraordinary. Universal praise for once would not be a cliché. Not just praise of the ‘good effort’ kind – genuine emotion at having captured something quintessentially British. Examples here, and here, and here. The appreciation seems to have come equally from left and right: when one Conservative MP tweeted that it represented ‘leftie multicultural crap’, his comment was described as ‘idiotic’ by the Prime Minister. I think those watching from overseas will be able to understand a lot of this. There is the British sense of humour, the evocative depiction of the first transformation from a rural to industrial society, the central role of immigration, and consequent cultural diversity. But why so much time devoted to the National Health Service (NHS)? – that seemed to puzzle some in the US at least. To suggest that the NHS should be replaced by a system based on insurance would be political suicide. That is why David Cameron promised that there would be no top down reform of the NHS if he was elected, and why many – even in his own party – suggest that his failure to honour that commitment may be his undoing. Of course principles and practice do not exactly converge. There are some minor charges within the NHS, and there is plenty of private, insurance based provision available alongside the NHS. Nor do I want to argue that this attachment to the principle of equality of health provision is necessarily logical or consistent with British attitudes in other areas, but just to note that it exists. Is this attachment to the NHS national self delusion? After all, many countries seem to have replaced their monarchies with alternative heads of state, and are doing just fine. I think there is a difference. The monarchy in the UK symbolises our history – its actual function is relatively trivial beyond that. The NHS embodies a principle that in critical matters involving health, all members of a society should be equal. Overall the UK is not a particularly equal society, and income and wealth inequalities have been growing, but this is one area where there is a strong national consensus that while additional income should mean that you contribute more to a health service, this does not entitle you to receive better treatment. Do the British pay dearly for this attachment to equality in health provision? If you look at measures of quality or efficiency, the UK does reasonably well (for example here or here), but what does appear consistent is how badly the US performs in terms of efficiency. (For some clues as to why, see Timothy Taylor here.) So what seems more likely is that it is the US aversion to government involvement in health provision that is a little delusional. Which of course brings us back to that certain US politician, who not only came up with a plan to try and improve the US health care system, but when the President took it up, he has been kind enough to let the President take all the credit. Nick Rowe is exasperated at how some bloggers think all mainstream macroeconomists believe in the money multiplier and did not realise that loans can create deposits. He says go and read a first year textbook. It is true that no macroeconomist I have ever talked to about this actually thinks the money multiplier is relevant to monetary policy today. And I am sure that Nick is right that good first year textbooks tell you that loans can create deposits as well as telling us about the money multiplier. But this does raise a rather embarrassing question for macroeconomists – why is the money multiplier still taught to many undergraduates? Why is it still in the textbooks? One response might be that it takes time for textbooks to catch up with macroeconomic reality. But this would only be an excuse if central banks had been routinely using the money multiplier 20 or 30 years ago. It is true that there was a brief attempt to control monetary aggregates in the UK and the US in the early 1980s, but it was quickly abandoned. In the case of the UK, the money multiplier had nothing to do with how the monetary authorities tried to control monetary aggregates. So this hardly warrants inclusion in a first year macro textbook. I think I know why it is still in the textbooks. It is there because the LM curve is still part of the basic macro model we teach students. We still teach first year students about a world where the monetary authorities fix the money supply. And if we do that, we need a nice little story about how the money supply could be controlled. Now, just as is the case with the money multiplier, good textbooks will also talk about how monetary policy is actually done, discussing Taylor rules and the like. But all my previous arguments apply here as well. Why waste the time of, and almost certainly confuse, first year students this way? I’ve complained about this before in this blog, and in print. (In both cases I was remiss in not mentioning Brad DeLong’s textbook, which does de-emphasise the LM curve.) The comments I received were interesting. The only real defence of teaching the LM curve was that it told you what would happen if monetary policy acted in a ‘natural’ way due to ‘impersonal forces’, whereas something like the Taylor rule was about monetary policy activism. Well, I count this as an excellent reason not to teach it, because it gives the impression that there exists such a thing as a natural and impersonal monetary policy. Anyone who was around during the monetarist experiments in the early 1980s knows that fixing the money supply is hardly automatic or passive. I know this is a bit of a hobbyhorse of mine, but I really think this matters a lot. Many students who go on to become economists are put off macroeconomics because it is badly taught. Some who do not go on to become economists end up running their country! So we really should be concerned about what we teach. So please, anyone reading this who still teaches the money multiplier, please think about whether you could spend the time teaching something that is more relevant and useful. For economists. This post arose out of remark I made in response to comments. I’m not sure I want to defend the original remark too much, but I think there is a discussion here that some may find interesting. So what did I mean? Of course I knew that Leijonhufvud is highly critical of much of modern macro. But what I had in mind was what I remembered of ‘Keynesian Economics and the Economics of Keynes’, which I read when young and which made a big impression. (For a more recent assessment, see this review by Howitt.) At the time there were attempts being made to partially microfound Keynesian economics by looking at rationing regimes where either goods or labour markets did not clear. Leijonhufvud was critical of this, and the earlier, emphasis on wage and price rigidity as being at the heart of Keynesian economics, both in terms of an interpretation of Keynes but also as useful macroeconomics. What I also remember, but did not fully appreciate at the time, was a good deal of discussion of the importance of intertemporal coordination failures, in which people’s expectations about long-term interest rates differ from the marginal efficiency of capital. For many, New Keynesian economics is just a microfounded version of Old Keynesian economics. But what that means in practice is that New Keynesian theory is explicitly intertemporal, which IS-LM is not. Another way of describing New Keynesian theory, which I have used myself, is that it is a RBC analysis with price stickiness added on. In a technical sense that may be true, but I think it can be misleading in that it perpetuates the idea that these models are ‘all about’ wage and price rigidity. Now it may or may not be the case that wage and price rigidities are preconditions for Keynesian analysis. I have argued elsewhere that a better way of saying it would be that price flexibility coupled with an appropriate monetary policy may rule out Keynesian problems, but that at the Zero Lower Bound (ZLB) inflation targeting does not. However it is also plausible to argue that the existence of money is a precondition for effective demand to matter in determining output, but not many people say that money is what New Keynesian analysis is all about. (Particularly as money is often not even part of the model.) You could also argue that imperfect competition was an essential ingredient in New Keynesian analysis, but again not many would characterise New Keynesian analysis as the macroeconomics of imperfect competition. If I had to characterise New Keynesian theory by one thing, it would be the analysis of economies where the real rate of interest differed from the ‘natural’ real rate. The natural rate is the real interest rate that would obtain if output was determined by an RBC model – less precisely, if output was determined from the supply side. We often say the natural rate of interest is the real interest rate that would occur under flexible prices, but that is shorthand for the above, and perhaps misleading shorthand on occasion. Once we have the ‘wrong’ real interest rate, then (using imperfect competition as a justification) New Keynesian analysis determines output and perhaps employment only from the demand side, and the determination of effective demand becomes critical to the model. Perhaps a better way of saying this is that if real interest rates are at their natural level, we do not need to think about demand when calculating output. In most cases, it is the job of monetary policy to try and get the economy back to this natural real interest rate. This gives you the key insight into why, ZLB problems apart, it is monetary rather than fiscal policy that is the primary stabilising policy. We can make the same point another way. In the New Keynesian model, business cycles are generally an intertemporal mismatch between demand and supply (unless, for some reason, we get stuck with demand deficiency). What is the relevant price that influences this intertemporal allocation of demand? – the real interest rate, not the price or wage level. So if we have to think about New Keynesian economics as being about some price being wrong, that price is the real interest rate. And thinking in an explicitly intertemporal framework also makes you think twice about adding M/p into an IS curve, which is partly where the idea that sticky prices are crucial comes from. Of course at some level the idea of characterising a class of models by one key idea is a bit pointless. But at another, more intuitive, level I think it can be helpful. In this case, for example, it suggests why monetary rather than fiscal policy is the policy of choice for stabilisation. This is also a good example of where IS-LM is less revealing: in this framework both policies look as good as each other within the context of the model itself. This is why I claimed a connection between some of the ideas in Leijonhufvud’s Keynesian Economics and the Economics of Keynes and my interpretation of New Keynesian economics. I could now make sense of Leijonhufvud’s emphasis on talking about real interest rates, rather than wage and price rigidity. But I would be the first to admit that it is easy to see in what other people write what you want to see, so I have no problem with other people disagreeing with me on this interpretation. And even if there is something in what I say, I know of course that Leijonhufvud is highly critical of other aspects of New Keynesian analysis, and that his views may well have changed since that book. But what I do hope is true is that my interpretation of New Keynesian analysis is of some help to those who struggle to see what the nature of the market failure is in some modern Keynesian analysis. The idea is to temporarily increase government spending, and pay for it completely by temporarily raising taxes. There is no increase in government budget deficits or debt. This may seem like giving with one hand and taking with the other, but it has the effect of raising demand, because some of the taxes come from reduced saving, rather than lower consumption. Once demand rises, incomes increase, and theory suggests that in a closed economy the multiplier would be one. (For those who want more detail, see here, and for specific past proposals to implement this policy, see here for the UK and here for the US.) The only argument I have seen that it would not raise demand is if all consumers believed the tax increase was permanent. That seems highly unlikely. Of course many of us would argue that debt financed fiscal expansion is also a magic button, but many other people do genuinely worry about government debt. With the balanced budget button they do not have to. I have heard people say that the balanced budget multiplier might be quite a lot less than one in an open economy like the UK. But this depends entirely on where the extra government spending goes. If it is all spent on goods or services produced in the UK, the multiplier is still one. Imagine, if you can, that as a price of joining the coalition, the Liberal Democrats had insisted on having the post of Chancellor rather than deputy PM. Would the LibDem Chancellor not have pushed this magic button? The benefits are clear. The cost? Some short term political embarrassment perhaps in relaxing austerity that was before deemed unavoidable. But there is a perfect excuse – the Euro crisis. Unlike their Conservative partners, the LibDems would not be burdened with claiming that fiscal stimulus didn’t work when they were in opposition. So I am left with only one plausible reason why the current Chancellor has not pushed the magic button and that is because he does not want to. Why? Well an obvious problem with balanced budget fiscal expansion is that it increases the size of the state. Even though it is only temporary, as a Conservative this is not something you want to do. In addition, if one of the ‘benefits’ of a debt crisis is that it gives you a pretext to shrink the size of the state, then undertaking balanced budget fiscal expansion stops that goal being achieved. You would, in this sense, be wasting a crisis. I originally wrote this before the latest fall of 0.7% in second quarter GDP was announced. (Note for US readers, this is a quarter on previous quarter fall, not annualised!) When I saw the Chancellor talking about these figures, he was being filmed outside a government funded construction project, and I had the feeling he had been doing quite a lot of this recently. This was confirmed in this Stephanie Flanders piece. She notes that this particular construction project was agreed by his Labour predecessor, but then delayed by this Chancellor when he came into office. In addition, a major contributor to the recent GDP fall was construction, in large part because of a decline in public investment! This reminded me of George Orwell's 1984, where he made famous the idea that the best way to disguise the true purpose of something was to call it the opposite, like the Ministry of Peace that wages perpetual war. Perhaps we are seeing the televisual equivalent. So do not be too surprised, if the UK economy carries on being this successful, to hear that the U.K. Treasury has been renamed the Ministry of Growth. (1) Recently the Chancellor has undertaken, with the Bank, various measures designed to stimulate private investment. These are welcome, although they are also generally consistent with the argument I'm making here. Although there may be doubts about some of these measures as an alternative to public investment, to the extent that the market for borrowing for private investment is currently distorted by excessive caution and the rebuilding of banks balance sheets, effective subsidies for borrowing make sense. However their uncertain overall impact means they are no magic button. Consumption and Complexity – limits to microfoundations? One of my favourite papers is by Christopher D. Carroll: "A Theory of the Consumption Function, with and without Liquidity Constraints." Journal of Economic Perspectives, 15(3): 23–45. This post will mainly be a brief summary of the paper, but I want to raise two methodological questions at the end. One is his, and the other is mine. 1) The marginal propensity to consume (mpc) out of transitory income is a lot smaller than the ‘about one third’ suggested by Friedman. However Friedman stressed the role of precautionary savings, which are ruled out by assumption in the IC model. Within the intertemporal optimisation framework, it is almost impossible to derive analytical results, let alone a nice simple consumption function, if you allow for labour income uncertainty and also a reasonable utility function. What you can now do is run lots of computer simulations where you search for the optimal consumption plan, which is exactly what the papers Carroll discusses have done. The consumer has the usual set of characteristics, but with the important addition that there are no bequests, and no support from children. This means that in the last period of their life agents consume all their remaining resources. But what if, through bad luck, income is zero in that year. As death is imminent, there is no one to borrow money from. So it therefore makes sense to hold some precautionary savings to cover this eventuality. Basically death is like an unavoidable liquidity constraint. If we simulate this problem using trial and error with a computer, what does the implied ‘consumption function’ look like? To cut a long (and interesting) story short, it looks much more like Friedman’s model. In effect, future labour income is discounted at a rate much greater than the real interest rate, and the mpc from transitory income is more like a third than almost zero. The intuition for the latter result is as follows. If your current income changes, you can either adjust consumption or your wealth. In the intertemporal model you smooth the utility gain as much as you can, so consumption hardly adjusts and wealth takes nearly all the hit. But if, in contrast, what you really cared about was wealth, you would do the opposite, implying an mpc near one. With precautionary saving, you do care about your wealth, but you also want to consumption smooth. The balance between these two motives gives you the mpc. There is a fascinating methodological issue that Carroll raises following all this. As we have only just got the hardware to do these kinds of calculation, we cannot even pretend that consumers do the same when making choices. More critically, the famous Freidman analogy about pool players and the laws of physics will not work here, because you only get to play one game of life. Now perhaps, as Akerlof suggests, social norms might embody the results of historical trial and error across society. But what then happens when the social environment suddenly changes? In particular, what happens if credit suddenly becomes much easier to get? The question I want to raise is rather different, and I’m afraid a bit more nerdy. Suppose we put learning issues aside, and assume these computer simulations do give us a better guide to consumption behaviour than the perfect foresight model. After all, the basics of the problem are not mysterious, and holding some level of precautionary saving does make sense. My point is that the resulting consumption function (i.e. something like Friedman’s) is not microfounded in the conventional sense. We cannot derive it analytically. I think the implications of this for microfounded macro are profound. The whole point about a microfounded model is that you can mathematically check that one relationship is consistent with another. To take a very simple example, we can check that the consumption function is consistent with the labour supply equation. But if the former comes from thousands of computer simulations, how can we do this? Note that this problem is not due to two of the usual suspects used to criticise microfounded models: aggregation or immeasurable uncertainty. We are talking about deriving the optimal consumption plan for a single agent here, and the probability distributions of the uncertainty involved are known. Instead the source of the problem is simply complexity. I will discuss how you might handle this problem, including a solution proposed by Carroll, in a later post. Bloomberg quotes German Vice Chancellor Philipp Roesler as saying “What’s emerging is that Greece will probably not be able to fulfil its conditions. What is clear: if Greece doesn’t fulfil those conditions, then there can be no more payments.” (HT PK) OK, this is just the kind of thing you would expect to be said in negotiations between creditors and debtors. We have been here before, and the rhetoric appeared to work on the Greek electorate. In the Cold War, we mercifully only had a few moments like this, and we were lucky. But if you keep playing this game, one day you will lose control. Sometimes it seems as if Germany and its supporters are like a poker player with a very weak hand, who has managed to convince all the other players that their hand is much stronger than it is. But there is a danger that you may get so good at playing this bluff, that you may stop looking at your cards and actually believe you have a strong hand. Or worse still, that although your hand is weak, you deserve to have the better cards, and therefore you do have the better cards. Reading the latest IMF report on the Eurozone, it seems to me that the IMF has decided they cannot be a part of this game anymore. The idea that those dastardly Greeks just refuse to take their medicine is absurd. Take a look at what has happened to fiscal policy in Greece, measured in a way that gives a true indication of the extent of policy adjustment that has been made. Of course the slide into deficit after joining the Euro was very bad policy. No correction was going to be easy. But a move from a 10% of GDP deficit to an expected 5.5% surplus in just four years is a cold turkey cure. The patient should be receiving support and kind words, rather than being told that they are not fulfilling their obligations. The worry is that those saying these foolish words have begun to believe them. I have talked about why Greece leaving the Eurozone would be much worse for the Eurozone than Greece elsewhere. I’ve also speculated that as a result it will not happen, which may have been a foolish thing to believe. But even if it is not foolish, and the Eurozone gets through all this, the long term damage of what is happening now should not be underestimated. Now I’m less interested in who is right or wrong here, as that the debate should have ended this way. (Although I have to say, I’m not sure Varoufakis is right about the UK. That button actually exists, it is called balanced budget fiscal expansion, and it has not been pressed!) When parts of an economy have suffered greatly, and the leaders of other countries appear not to recognise this fact, have any sympathy for it, and at least appear to have a large hand in prolonging that suffering, even the wisest of people will begin to suspect the worst of these countries motives. Whether they are right or wrong does not matter too much, because the damage is done. And if Greece leaves, that experience is likely to be repeated again and again in other countries, if it hasn’t happened already. In these circumstances, the idea that a solution to current problems involves moves to greater union become fanciful. Even if each individual crisis passes, the slow poison of mistrust that these events create may end up killing the project. Those in the Eurozone with more sensible heads on their shoulders need to stop this poker game, quickly. I’ve only written one of these Socratic/tutorial dialogue type posts before, mainly because I cannot make them as amusing as Tim Harford or Brad DeLong. This one was inspired by these questions. Q: I get why interest rates cannot go below zero. But why is that such a big deal? A: Because it means that monetary policy cannot do its job. Q: But I thought monetary policy was about keeping inflation low. A: In part. But we also rely on monetary policy to ensure that aggregate demand matches the output the economy as a whole wants to produce. Q: Isn’t that what the price mechanism is for – matching supply and demand? A: This is a good example of where thinking about a single market is not a good way of thinking about the macroeconomy. While in the long run you would expect aggregate supply and demand to match, in the short run they need not. People can decide to save more, and investment need not rise to compensate, so demand can fall below supply, leading to unemployment rising. Q: Yes, I remember our discussion about savings and investment. But unemployment can always be cured by falling wages, surely. A: Not if prices are falling at the same time. To say unemployment is too high because real wages are too high in this situation just misses the point. Q: But if both wages and prices start falling, will that not lead to a recovery in demand? What stops that happening? A: The conventional answer is that prices are sticky, so this process happens only slowly. That certainly seems to be true, but it’s an interesting question whether adjustment would occur even with flexible prices. Q: Ah yes, sticky prices – that is all this Keynesian stuff that is so controversial. So if you believe prices are sticky, does that mean booms and recessions caused by fluctuations in demand are inevitable? A: No, as I said earlier, that is monetary policy’s other job. We have very good reasons to think that aggregate demand depends negatively on the real interest rate. So there should always be some real interest rate that brings demand equal to aggregate supply. Q: And the central bank tries to guess what that interest rate is each month? A: Basically yes, although they can only determine nominal interest rates, so they also need to estimate what expected inflation will be. I hope you remember the definition of real interest rates. Q: Of course. And now I see the problem. If the required level of real interest rates is significantly negative, and expected inflation is low, even nominal interest rates at zero may not be enough to get demand high enough. Q: But now I’m puzzled. If prices are flexible rather than sticky, surely that would make things worse, not better. In a recession it means negative inflation, and therefore higher real interest rates – it goes in the wrong direction! A: Careful. I thought you said you remembered the definition of real interest rates. It’s expected inflation that matters, not actual inflation. Q: Sure, but if inflation is falling, surely expected inflation will fall too. A: Not if the central bank had a target for the price level, or something else related to it, and people believed the bank could and would achieve that target. Then for every fall in actual prices, expectations about inflation in the future would rise. Q: Like what goes down, must come up again. That reminds me of the other day ..
A: I’ll stop you right there. You should not even attempt to make these dialogs as amusing as those other bloggers. Stick to the economics. Q: If you insist. So you are saying flexible prices would work after all. If the price level fell enough, expectations about inflation would rise enough to get real interest rates low enough, even if nominal rates were at zero. A: Yes, but remember what I said about people needing to believe that the central bank could and would do that. And if people are not fooled, it would require future actual inflation to rise in line with expectations. Q: Which would conflict with the other goal of the central bank, to keep a lid on inflation. A: Indeed. Most central banks now have inflation targets, rather than price level targets. So if they were doing their job, they would stop inflation rising enough to get real interest rates low enough. Q: So with inflation targets, even price flexibility might not be enough to ensure aggregate demand was equal to supply if demand fell by a large amount. So why is this Keynesian stuff controversial – it seems to be important whether prices are sticky or not. A: I would agree. In the past, before you were born, economists talked about the real balance or Pigou effect saving the day, but that is hardly mentioned nowadays. I’m not entirely sure why. Q: But my textbook says Keynesian economics is all about the economics of sticky prices. A: That is the same textbook that says the central bank fixes the money supply. Q: Yes. You never did explain to me why the textbook says that even though it’s not true. A: I’m not sure I can. But it helps explain the emphasis on price rigidity when discussing Keynesian economics. Money targets are a variation on a price level target, so in that case price flexibility could be enough as we have just seen. For this reason, and perhaps for other reasons as well, textbooks in my view place too much emphasis on price rigidity as a pre-condition for Keynesian analysis, and too little on good monetary policy as being essential in controlling short run aggregate demand. Q: You do not seem to like my textbook much. But anyway, whether prices are sticky or not, being at the zero lower bound pretty well proves that there is not enough demand in the economy at the moment, and so we need to focus on ways to increase demand. That cannot be controversial. A: Oh how I wish you were right. Martin Wolf has a nice post explaining the financial crisis using sector financial balances. He rightly attributes this way of looking at things to Wynn Godley. It goes way back – I remember using them as a cross-check on forecasts in the UK Treasury in the 1970s, but it was probably Godley’s influence that helped that happen too. They are not a substitute for thinking about macroeconomic behaviour, but they can often be a very useful check on whether your thoughts (or forecasts) make sense. The policy itself does not directly change the government sector’s financial balance (by definition). Theory tells us that consumers will smooth the impact of temporarily higher taxes, so their sector will move into deficit. But if we were foolish enough to think the story stopped there, thinking about financial balances tells us that has to be wrong. Consumers are in deficit, and no sector has moved into surplus. Keynesian theory then tells us what happens to put things right: output and incomes increase until the point that the consumer sector is no longer in deficit. If you think about it (and given consumption would always fall by less than post-tax income because of smoothing), this has to be the point at which income has increased by an amount equal to the tax increase i.e. a balanced budget multiplier of one. We could talk about this as a dynamic multiplier process, or we could talk about rational consumers working this out, and so not bothering to reduce their consumption in the first place. Looking at sector balances are not a substitute for thinking about behaviour, but they can and should demand that we are able to tell stories about them that make sense. Where I think criticism of the mainstream macroeconomic profession is correct is that there were not enough people telling convincing stories about why the household sector balance was evolving the way it did over the two decades before the recession. (I talk more about this here.) What was I doing? The answer is writing papers looking at the impact of fiscal policy in DSGE models, and not looking at this kind of data at all. In that sense I was definitely part of the problem, although it did kind of come in useful later on. When the IMF undertakes an Article IV mission, they publish a preliminary report at the end of their visit, and a full report a couple of months later. I wrote about their preliminary report in May, and today we have the final version. So for the second night running I’ve stayed up too late reading IMF material. While not quite a page-turner, this report is full of good stuff. I’ve already mentioned the pessimistic near term outlook for growth. What is just as depressing is their view that “the output gap is projected to remain large for an extended period and not close until 2018.” What is more, they are quite clear that “the risks to the baseline are predominately to the downside” – that means their assessment is more likely to be too optimistic rather than too pessimistic. As a result, they conclude “A more supportive macroeconomic policy stance is hence essential”, with none of the usual ifs and buts. Their recommendations of monetary policy are extensive and detailed. They note that “monetary and credit conditions remain tight due to elevated risk aversion and rising bank funding costs”. They recommend reducing interest rates from 0.5% to 0.25%. They note that “standard rules-of-thumb suggest that cutting the policy rate by 25 basis points could boost growth by 0.1-0.2 percentage points—perhaps equivalent to fiscal stimulus of 0.2-0.4 percent of GDP”, but they suggest that may be an underestimate in current circumstances. Their final paragraph on monetary policy is worth quoting in full. “The government has also announced that it is considering expanding government guarantees (for a fee) to fund large, privately operated infrastructure projects. Boosting infrastructure spending would support growth, given its high multiplier and ability to increase productive capacity. However, it is important that the choice of projects and the modalities of their operation (public versus private) and financing (e.g., issuing public debt versus guarantees) be based on efforts to use public funds as efficiently as possible. Such decisions should not be affected by artificial attempts to limit government gross debt or near-term expenditure by transforming costs into contingent liabilities that might be realized only later.” I couldn’t agree more. The IMF estimate that fiscal “consolidation has so far reduced GDP by a cumulative 2½ percent.” Their multipliers look a little low to me, but its good to have some numbers out there. They note that the government has over the last year tried to change the fiscal mix to promote growth, but “the macroeconomic impact of such measures is likely to be modest”, and it recommends that more should be done. 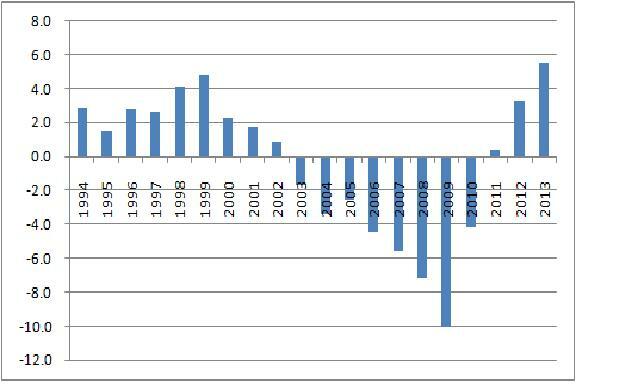 The report is quite clear that if growth does not pick up, the Chancellor’s deficit reduction plan should be abandoned. Jonathan Portes has already highlighted why the IMF believes this would not lead to adverse market reaction. It also raises the question about why they do not recommend short term fiscal stimulus under their baseline, which is hardly rosy. The answer may lie in Annex 3, which simulates exactly this under various different assumptions on hysteresis and multipliers. How they do this looks slightly odd to me, but hopefully I can investigate this further at a later stage. Daniel Gros has a Vox piece attacking the Krugman/Layard manifesto. Like Stephanie Flanders here, there is part of me that is tired of going over this again and again, as the arguments on the other side do not get any better. But I know that this is a battle we have to win, if only so that others do not need to fight it a third time. And I did have one new thought. Before that, let’s just go through the economics one more time. Macroeconomic theory is as clear as it can be that austerity in the current situation will reduce output and raise unemployment. That is the theory in undergraduate textbooks, or modern microfounded theory. The evidence is also about as clear as it ever is in macro. On the other hand, the ‘evidence’ Daniel Gros uses is of the following kind. The US recovery has been similar to that in the Eurozone, and the US had more initial fiscal expansion, so therefore austerity is not that important. These are the kind of arguments we use to persuade our students that they should take a course in econometrics. But here is my new thought. Why not apply the same arguments to monetary policy. Interest rates were reduced faster and by more in the US than in the Eurozone, but the recovery has been similar, so clearly monetary policy does not matter much either. In the UK the recovery has stalled even though interest rates are zero. In addition keeping interest rates very low can cause longer term problems, so start raising them now, if not yesterday! No one (almost) makes this argument, because it is so obviously silly. So why do good economists think they can make the same argument for fiscal policy? The only defensible argument for austerity now is that we have reached some critical debt limit, but the low level of interest rates on UK and US debt (and everywhere else besides the Eurozone) kill that dead. Everyone is agreed that once recovery is complete, we do need to start reducing debt. Everyone also agrees that when the recovery is complete, interest rates need to rise. But almost no one is arguing for higher interest rates now. So why fiscal austerity now? The language of the latest IMF report on the Eurozone could not be clearer. The Fund says that “A more determined and forceful collective response is needed.” The report contains many proposals for action. For example “the first priority is a banking union for the euro area”. But the proposals that I want to highlight are those for the ECB. They include a call for further interest rate reductions. In addition, the report suggests Quantitative Easing. 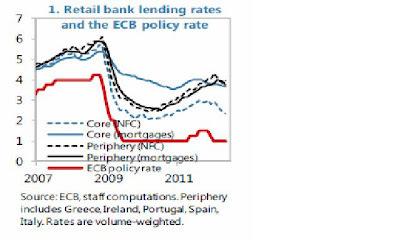 Until now such a policy has looked too much like fiscal dominance to the ECB: bailing out irresponsible governments. But as the IMF show clearly with this chart, such action can simply be justified as part of its monetary policy operations. Not only are high interest rates on government debt in Greece, Ireland, Portugal, Spain and Italy producing fiscal austerity, but they are leading to a much tighter monetary policy in those countries. QE can be justified as a means of reversing this completely counterproductive (given the degree of fiscal austerity already implemented) monetary contraction. 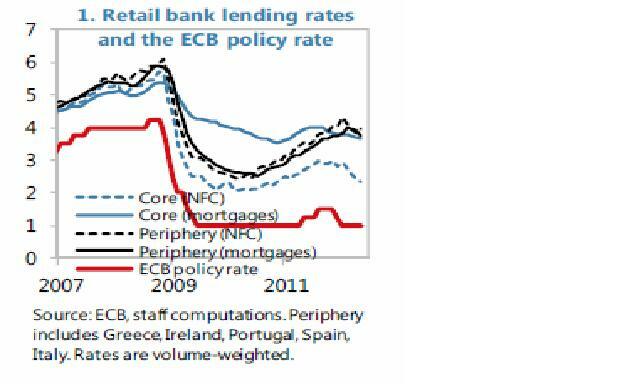 The idea that ECB bond purchases would induce problems of moral hazard in the periphery countries is absurd. These countries, as the IMF report points out, are already tightening their fiscal policy substantially: deficits are being cut much more rapidly than they should be from a macroeconomic point of view. In this context, to worry that QE type operations directed at periphery bond markets would induce moral hazard or indicate some kind of loss of ECB independence or fiscal dominance is ridiculous. This is a follow on to this post, and an earlier post by Paul Krugman. I’m currently reading an excellent account by Jonathan Heathcote et al of “Quantitative Macroeconomics with Heterogeneous Households”. This is the growing branch of mainstream macro that uses today’s computer power to examine the behaviour of systems with considerable diversity, as opposed to a single (or small number of) representative agent(s). (Heterodox economists may also be interested!) I want to talk about the methodological implications of this kind of analysis at some future date, but for now I want to take from it another example of letting theory define reality. The advantage of this second approach is that it reduces the chances of Lucas critique type mistakes, where policy actions change the extent of private insurance. The disadvantage is that these models “often imply substantial state-contingent transfers between agents for which there is no obvious empirical counterpart”. In simpler English, they predict much more insurance than actually exists. The first approach is what I have described in a paper as the ‘microfoundations pragmatist’ position: be prepared to make some ‘ad hoc’ assumptions to match reality within the context of an otherwise microfounded model. I also talk about this here. The second approach is what I have called the ‘microfoundations purist’ position. Any departure from complete microfoundations risks internal inconsistency, which leads to errors like (but not limited to) the kind Lucas described. As an intellectual exercise, the ‘model what you can microfound’ approach can be informative. Hopefully it is also a stepping stone on the way to being able to explain what you see. However to argue that it is the only ‘proper’ way to do academic macroeconomics seems absurd. One of the key arguments of my paper was that this ‘purist’ position only appeared tenable because of modelling tricks (like Calvo contracts) that appeared to preserve internal consistency, but where in fact this consistency could not be established formally. If you think that only ‘modelling what you can microfound’ is so obviously wrong that it cannot possibly be defended, you obviously have never had a referee’s report which rejected your paper because one of your modelling choices had ‘no clear microfoundations’. One of the most depressing conversations I have is with bright young macroeconomists who say they would love to explore some interesting real world phenomenon, but will not do so because its microfoundations are unclear. We need to convince more macroeconomists that modelling choices can be based on what you can see, and not just on what you can microfound.